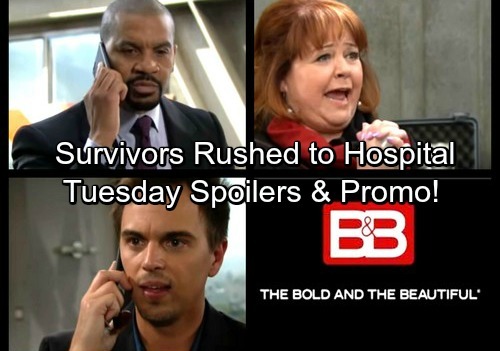 The Bold and the Beautiful (B&B) spoilers for Tuesday, November 7, tease that there’ll still be panic outside the collapsing Spectra building. Shirley (Patrika Darbo) will be a mess, but she’ll try to hold out hope for Sally (Courtney Hope). She’ll do her best to convince Saul (Alex Wyse) and Darlita (Danube Hermosillo) that everything’s going to be OK, but they’ll all look worried. Meanwhile, Justin (Aaron D. Spears) will snap at Wyatt (Darin Brooks) over the phone. The Bold and the Beautiful spoilers say Wyatt will seek updates on Liam (Scott Clifton) and Sally. He’ll want to know if they’ve been found in the rubble, but Justin may not have any additional news about their rescue. It seems Justin will be more concerned about how Spencer Publications is going to handle this. B&B fans know that Justin always tries to have Bill’s (Don Diamont) back. 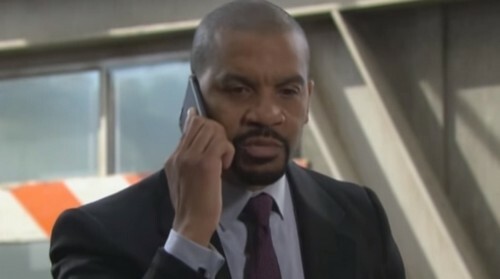 Since Bill is busy searching for Liam, Justin will attempt to keep a clear head and focus on the business end of things. The Bold and the Beautiful spoilers say Justin will rant about what could happen if word gets out to the public. He’ll mention the dangerous situation Liam’s in thanks to Bill. Of course, Justin played a role in the peril as well. Communication is critical when you need to make sure people are off the demolition site. Wyatt will do what he can to keep the drama contained, but that won’t stop him from fretting. Until Liam and Sally are safe, nothing else really matters. Fortunately, Sally and Liam will indeed be rescued. Thanks to Steffy (Jacqueline MacInnes Wood) and Bill’s efforts, they’ll be saved in the nick of time. The Bold and the Beautiful spoilers state that Liam and Sally will be rushed to the hospital. They’ll be on the mend soon, but this whole experience will leave them with complicated feelings. The dark moments they shared will force them to address what’s truly going on between them. Liam and Steffy’s crumbling marriage will add to all the complications. Some tough choices will have to be made in the near future. We’ll keep you posted as other B&B details emerge. Stay tuned to the CBS soap and don’t forget to check CDL often for the latest Bold and the Beautiful spoilers, updates and news.